Late H.M. Inspector of Salmon Fisheries for Scotland and Author of "Treatise on Salmon" in "Stanford's History of British Industries", Prize Essay on Harbour Accommodation for Fishing Boats, "The Angler and Sketcher's Guide to Sutherland", etc. The following cruises occupied several summer seasons a good many years ago. They were made in a cutter yacht of thirty-five tons, in which I sailed more than 7000 miles, going twice round Great Britain, visiting the Orkney and Shetland Islands, the Inner and Outer Hebrides, and also parts of Ireland, France, and Norway. An account of one or two of the cruises appeared in well-known magazines. But the whole of them are now published for the first time in a complete form; and it is hoped that the numerous illustrations of picturesque localities, all taken from water-colour drawings made by me on the spot in the course of these cruises, will add something to the interest and value of the volume. 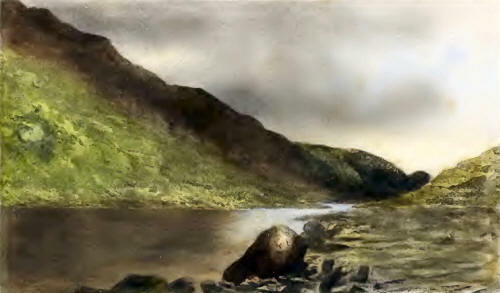 The black and white illustrations were made from my drawings by Messrs. J. Munro Bell and Co., Edinburgh; and for the coloured illustrations I am indebted to Messrs. E. S. and W. Forrest, Brandon Street Studio, Edinburgh, who first photographed the drawings, and then coloured them by hand after the original sketches. Pleasures and advantages of a yacht cruise in summer to the remote Highlands and Islands of Scotland — Description of the yacht Spray—Town and Bay of Stromness—Loch of Stenness— Druidical circle of Stenness—Ward Hill of Hoy—Three tall Standing Stones of Stenness—Kirkwall the capital of the Orkney Islands—Cathedral of St. Magnus—Earl Patrick’s Palace—Former plenty and cheapness of oysters in Orkney — Depletion of the oyster-beds — Importance of restoring and protecting them—Dwarfie Stone, Hoy Head, and Old Man of Hoy—Peerie Sea and Kirkwall—Sail from Stromness Bay to Loch Erriboll, and grand view of the precipices of Hoy Head —Picturesque view of entrance to Kyle of Tongue, with Ben Laoghal in the distance—Loch Erriboll, a quiet and land-locked haven—Detention in, for five days owing to stress of weather—Loch Hope and River —Excellent fishing in Loch Hope and River—Ben Hope—Description of the Smowe Cave—Cape Wrath — Long and picturesque range of lofty mountains extending from Ben Dearg, a few miles south of Cape Wrath, to Loch Ewe—Island of Handa—Description of Loch Marec— Town and Harbour of Portree—Storr Hill and Needle of Storr— Sligachan Inn and Pgurr nan Gillean—Glenelg—Loch Duich and Eilean Donan Castle—Falls of Glomaelc—Loch Hourn and Ben Sgroil —Sound of Sleat, Blaven, and the Coolins—Loch Sunart—Town and Bay of Tobermory—Loch Shiel, beauty and grandeur of its scenery —Details of fishing for several, seasons—Eilean Finnan, or Island of St. Finnan in Loch Shiel. No conveniences for being solitary and sulky on board a small yacht, so that a fund of good humour is the best sea-stock—Variety of scenery and sport in the Caledonian Canal—Elgin and Elgin Cathedral— Gordonstown, and the wizard Sir Robert Gordon—Spynie Castle for centuries the residence of the Bishops of Moray—Cromarty Firth and the Soutars of Cromarty—Cawdor Castle—Fine scenery between Fort George and the entrance to the Caledonian Canal — Glen Urquhart and Castle Urquhart—“Castle Urquhart visited,” a seriocomic poem—Fall of Foyers—Ascent of Ben Nevis before the days of road and observatory—Gleneoe and Loeh Leven — Dunstaffnage Castle—Dimolly Castle and Oban—Loch Swin and Castle Swin. 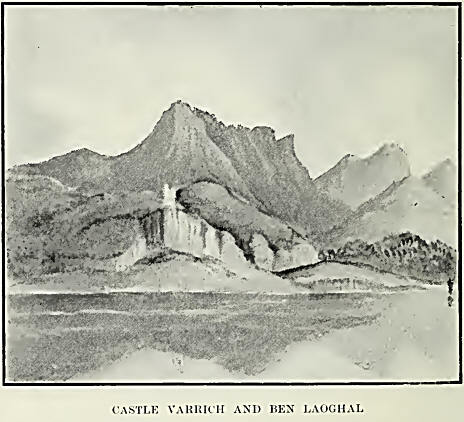 Grandeur, variety, and beauty of the scenery around Loch Etive—Lower Loch between Dunstaffnage and Bunawe comparatively quiet and sylvan; Upper Loch between Bunawe and Glen Etive wild and grand—Mountains on either side of Upper Loch Etive and above Glen Etive—Dangers of Connal Ferry and Rapids. Number of picturesque sea-lochs indenting the western shores of Sutherland, Ross-shire, and Inverness-shire—Loch Hourn one of the most beautiful and inaccessible of these—Noble outlines of Ben Sereel, which sweeps down in grand curves to the waters of Loch Hourn and seems to guard the entrance—Small rocky island at foot of Ardnamurchan Point; legend regarding it—Barrisdale in Loch Hourn— Ghastly story told by our pilot about his escape from the death-pit during an outbreak of cholera at St. Petersburg — Upper Loch Hourn above Barrisdale; its magnificent scenery—Abundance of sea-fish in Upper Loch Hourn—Strength of the tide in the Narrows of Upper Loch Hourn—Sound of Sleat and Blaven—Castle Moil, Kyleakin, and Portree — Dead-beat of fifty miles against a strong wind and heavy sea from Portree to Stornoway—Stornoway town, castle, and grounds—Splendid view from the highest point of the castle grounds. 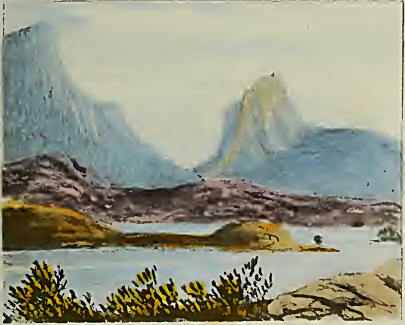 Run from Lerwick to the Bommel Fiord—Norwegian pilots—Waterfall at Ænaes—Bondhus Glacier, Moranger Fiord—Hardanger Fiord and branches—Yacht nearly run ashore owing to the pilot’s ignorance of the proper anchorage in the Moranger Fiord—Fine waterfalls a special feature in the landscape of the Hardanger Fiord—Sor Fiord and Eide Fiord, two branches of the great Hardanger—Village of Vik at the head of the Hardanger Fiord—Description of village of Vik —Excursion from Vik to the Voring Foss, the grandest waterfall in Norway—Saeters or shepherds’ huts near the Fall—Description of the Fall—Surefootedness and endurance of Norwegian ponies—Yacht nearly driven ashore by sudden and violent storm at Vik—From Vik to Bergen—Bergen—Fish-market—Athemeum, Museum, and Art Union—Cathedral—Leper Hospital—Run from Bergen to Lerwick in fifty-one hours. Peculiarities and attractions of the Shetland Islands—Their early history —Harold the fair-haired and the Princess Gida—Traces of the long dominion of Norway among the modern Shetlanders—Sumburgh Roost and Fitful Head—Links of Sumburgh, scene of a desperate battle between the Shetlanders and the men of the Lewis—Burgh of Mousa—Similarity of the Burgh of Mousa and the Nuraghe of Sardinia —Bard of Bressay, Ord of Bressay, and Noss Head—Sound of Bressay, one of the finest harbours in Scotland—Lerwick town and harbour— The Unicorn Rock a dangerous obstacle in the northern entrance to Bressay Sound—So named from the vessel belonging to Kirkaldy of Grange which was wrecked oil it while pursuing the ship belonging to the profligate Earl of Both well—Clcikum Loch and Island Fort near Lerwick—Lochs of Tingwall—Good trout-fishing in Lochs of Tingwall—Legend regarding tall upright monumental stone near the lochs—Scalloway Castle, a noble ruin—Nearly a third of the adult male population of the Shetland Islands occupied in seafaring pursuits—Influence of masonic fraternities in Shetland—Excursion to Noss Head—Ruined Burgh of Brindister, picturesquely placed on the very verge of a precipice rising 100 feet above the sea—Visit to the interior of a Shetland cottage—Whalsey Island and Mr. Bruce of Simbister House—Fetlar Island and Burgh Hall belonging to Sir Arthur Nicholson—Harbour of Uya Sound between the Island of Unst and the little Island of Uya—Unst the most northern and one of the largest of the Shetland Islands—Walk across Unst from Uya Sound to Balta Sound—Remains of Mouness Castle—Lochs on the road across abounding in trout—Abundance of golden plover and snipe—Balta Sound, a spacious and perfectly land-locked harbour— Heilaburn, or Burn of Health, in Unst—Chromate of iron largely wrought in Unst—Buness House in Unst from which the French philosopher Biot, in 1817, carried on a series of experiments for determining the length of the seconds pendulum—Loch of Clitf in Unst, the largest sheet of fresh-water in the Shetland Islands; excellent fishing in—Burra Fiord, Saxa Fiord, and Scaw Roost— Flugga Stack and Lighthouse in Unst, the northernmost lighthouse in the British Isles.